Home Beers Sin City Brewing Co. Sin City Stout | Sin City Brewing Co.
A traditional Irish Dry Stout, it is a full, richly flavored beer with a roasted, coffee-like taste and a hint of chocolate, balanced with an abundant hop profile that delivers a satisfying dry finish. A thick creamy head rests on top and holds the rich roasted aromatic qualities in the glass. This is truly the darker side of sin! It is a fine enough stout - works just fine for the Irish Car Bombs it's often used for at one of these bars. Maybe not the best, but there is absolutely nothing wrong with it. Not terrible, pretty basic. Not a Guinness, and not an American-ized version either, kind of watery and thin, yet bitter and dry, faint notes of cocoa and roast, non-distinct. Very simple stout. Classic to the style. Dark rich color, flavor and feel. No coffee, milk or other flavors that are often infused or brewed into the style. After the pot takes a while to settle letting you know the richness of the beer. Looks appropriate. Not particularly automatically muscular but smells like dark roast malt. Tastes like dark malt, not particularly roasted or charred. A little thin for the style. 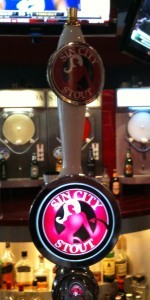 Sin City Stout from Sin City Brewing Co.